Welcome to Kieu Anh hotel ! 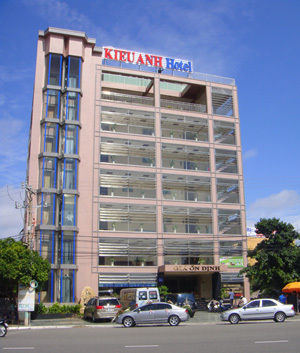 Kieu Anh hotel is located on Le Hong Phong street in Vung Tau coastal city, near roundabout war memorial,that is the best beautiful and largest Southeast Asia and next to the conference center of international exhibition and Pullman. hotelJust five munite you walk to the lovely Thuy Van beach. From hotel lobby you can see the Pictures and scenery of beautiful beaches with lovely waves,white sands and fresh sea water. you enjoy the fresh air and good for your health.You can go swimming or walking along the beach every sunrise and sunset. Kieu Anh hotel with 100 spacious rooms in 2 star standard, including special rooms for VIP and standard rooms. Please don’t miss Kieu Anh hotel an ideal place for you stay in Vung Tau coastal city and you will always satisfied with the best quality service and price stability. Kieu Anh hotel with 100 spacious rooms in 2 star standard, including 25 special rooms for VIP and 75 standard rooms. The hotel is designed in modern style: every floor has large lobby for guest broadband wireless access and relax .The rooms with wide windows afford great views of the wonderful beach of Vung Tau coastal city. Kieu Anh hotel provides a wide range of services to make your stay as comfortable and convenient as possible. Restaurant: our restaurant can accommodate up to 300 guests. with Over 30 traditional dishes cooked in style of Vietnamese.we serve breakfast and lunch buffets 7 days a week .Specially breakfast buffets is served free of charge to guests stay at the hotel.